UPDATE: Read more about the Overseas Chinese in North Korea in Charles Kraus, “Bridging East Asia’s Revolutions: The Overseas Chinese in North Korea, 1945-1950,“ The Journal of Northeast Asian History 11, no. 2 (Winter 2014): 39-70. After 1945, states in Northeast Asia began to either repatriate or attempt to assimilate internal others. In Yanbian, China, for example, many Korean peoples returned to independent Korea in 1945-1946; those who remained on the northern shores of the Tumen River were soon recast as ethnic-Koreans, members of the broader Chinese nation. In North Korea, there was neither assimilation nor repatriation. The roughly 50,000 Overseas Chinese in North Korea (朝鲜华侨 Chaoxian Huaqiao) were figuratively walled off from the rest of Korean society, even insulated from important political campaigns such as land reform (1946). Rather than absorption, the nascent North Korean state sought to preserve the separate identity of the Overseas Chinese, even granting them their own private schools. Moreover, North Korea also invited the Chinese Communist Party (CCP) to help jointly manage the Overseas Chinese, a significant but largely unknown chapter in the history of post-war Chinese-North Korean relations. This was a pragmatic strategy designed to build trust, expand people-to-people ties, and coordinate policies between Yan’an and Pyongyang. Although North Korea was already offering material support for the CCP’s war effort against the Nationalist Party, the CCP was invited to dispatch cadres to North Korea to help establish the Overseas Chinese Federation (OCF; 华侨联合会 Huaqiao lianhe hui) and administer Chinese-language schools. These cadres were also charged with building appreciation among the Overseas Chinese for the CCP, netting both vocal pledges of support as well as material donations for the army, and to improve the relationship between Chinese and Koreans on the ground. 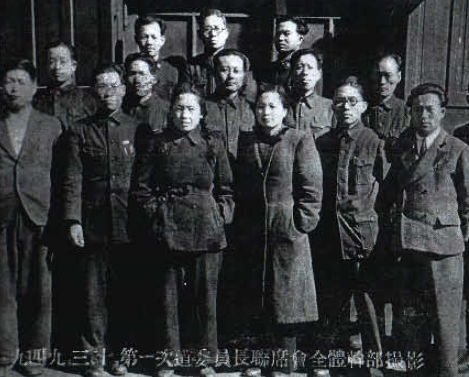 Propaganda was at the center of the Overseas Chinese Federation’s work. Utilizing radio reports and Xinhua dispatches, the organization began to publish a Chinese-language newspaper entitled Democratic Overseas Chinese (民主华侨 Minzhu Huaqiao) out of Pyongyang. In addition, the Federation published speeches and important documents from the Korean Workers’ Party in both Chinese and Korean. Many were concerned with laws and policies of the North Korean state or the fraught political situation on the Korean peninsula. However, others were explicit in their support of CCP imperatives; one of the most interesting (and likely useful) documents which was translated into Korean and circulated by the OCF among the local Korean community was Liu Shaoqi’s classic pamphlet Nationalism and Internationalism. The Overseas Chinese schools were spread far and wide across the northern half of the Korean Peninsula, numbering close to 50 in 1949. In addition to support coming from the Korean central government and the OCF, local Korean governments were also intimately involved in the revival and expansion of Overseas Chinese education. A report from North Hamgyong elaborated in great detail upon “outreach with local governments” (當地政府的联系 dangdi zhengfu de lianxi). 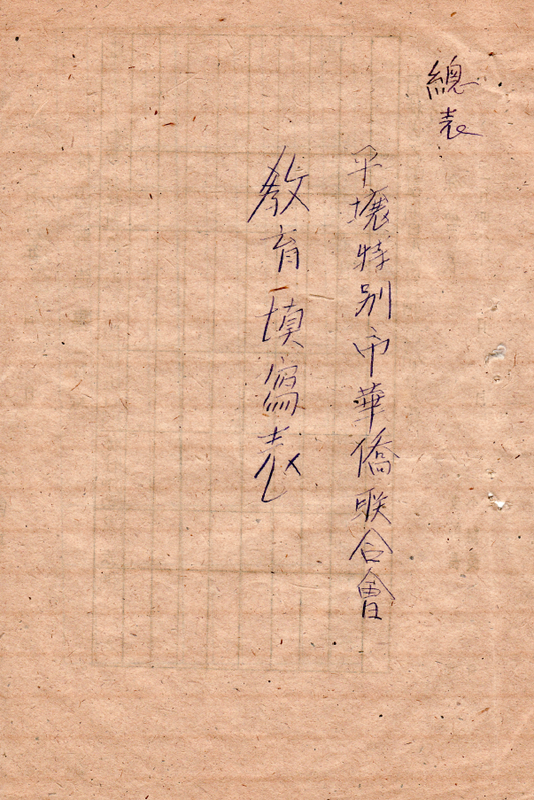 In the cities of Hoeryong and Chongjin, the local governments had provided materials for building repairs; in Nanam, the OCF and the local government held two “cadre parties” (干部联欢会 ganbu lianhuanhui) for Chinese and Koreans. In Songjin (Kimchaek), the local government provided school uniforms, while the Rajin government provided Korean teachers. The North Hamgyong report concluded that Korean schools and Chinese schools were receiving equal treatment from local governments and that the joint cadres meetings were helping to develop “a deeper Sino-Korean relationship” (中朝的关系更深刻了 Zhong Chao de guanxi geng shenke le). In North Pyongan, the provincial government also provided aid to the Overseas Chinese schools, including subsidies, assistance with construction and repair work, and grain rations. The OCF cadre therefore concluded that the Korean government “is very concerned about Overseas Chinese education” and offers assistance “without regard to nationality” (是不分民族的 shi bufen minzu de). A valve for cooperation and contact between Kim Il Sung’s North Korea and the Chinese Communist Party during the Chinese Civil War, the utility of the Overseas Chinese came to a conclusion in June 1950. While Chinese and Korean propaganda suggest that the Overseas Chinese by and large joined the “Fatherland Liberation War” on behalf of the North Korea and the Chinese People’s Volunteers, most Overseas Chinese in fact fled to Northeast China and by 1958 only 15,000 remained in the DPRK. Moreover, following the conclusion of the war, North Korea curbed its enthusiasm for Overseas Chinese education and pushed for the “Koreanization” (朝鲜化 Chaoxian hua) of the community, according to author Mu Dezheng (慕德政). Conflict, not cooperation, then, came to characterize Sino-North Korean interactions over the Overseas Chinese on the Korean Peninsula for much of the Cold War.